Ostrava (Polish: Ostrawa, German: Ostrau or Mährisch Ostrau) is a city in the north-east of the Czech Republic and is the capital of the Moravian-Silesian Region. It is a 50Km from the border with Poland, at the meeting point of four rivers: the Odra, Opava, Ostravice and Lučina. In terms of both population and area Ostrava is the third largest city in the Czech Republic, the second largest city in Moravia, and the largest city in Czech Silesia; it straddles the border of the two historic provinces of Moravia and Silesia. The population is currently around 300,000 (Data from 2013). 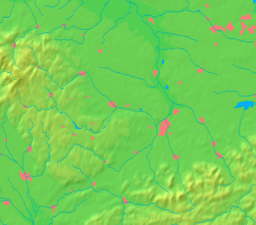 The wider conurbation – which also includes the towns of Bohumín, Doubrava, Havířov, Karviná, Orlová, Petřvald and Rychvald – is home to around 500,000 people, making it the largest urban area in the Czech Republic apart from the capital, Prague. Ostrava grew to prominence thanks to its position at the heart of a major coalfield, becoming an important industrial centre. It used to be nicknamed the country’s "steel heart" thanks to its status as a coal-mining and metallurgical centre, but since the Velvet Revolution (the fall of communism in 1989) it has undergone radical and far-reaching changes to its economic base. Industries have been thoroughly restructured, and the last coal was mined in the city in 1994. However, the city's industrial past lives on in the Lower Vítkovice area, a former coal-mining, coke production and ironworks complex in the city centre boasting a unique collection of historic industrial architecture. Lower Vítkovice has applied for inclusion in the UNESCO World Heritage List. The city’s coat-of-arms features a blue shield with a rearing silver horse standing on a green lawn. The horse wears a golden saddle and a red coverlet. At the top right of the shield there is a golden rose with green leaves and a red core. The horse in the coat-of-arms wears no bridle. The oldest known depiction of this coat-of-arms is on a seal dating from 1426; the first coloured version dates from 1728. The horse is often interpreted as a symbol of Ostrava’s position on a major trade route, or as a figure taken from the coat-of-arms of Ostrava’s first vogt (reeve), while the golden rose probably comes from the family coat-of-arms of the bishop of Olomouc Stanislav Thurzo. This explanation is supported by most modern literature. Another (somewhat more fanciful) theory states that the Bishop granted Ostrava the right to use the horse in its coat-of-arms out of gratitude for the assistance that the town provided to the people of the Bishop’s estate in Hukvaldy when the estate was being looted and pillaged; the help apparently came so quickly that the pillagers did not have time to attach bridles to their horses before making their escape. There is also a legend which tells of a siege of Ostrava during which the besieged townspeople released unbridled horses to run in circles around the town; this is said to have confused the attacking armies so much that they fled. In 2008, Ostrava’s new marketing logo was unveiled. Designed by Studio Najbrt, the logo “OSTRAVA!! 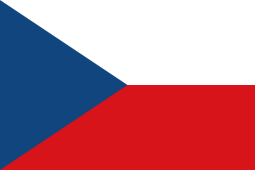 !” is used in public presentations of the city both in the Czech Republic and abroad. The three exclamation marks are meant to symbolise the dynamism, energy and self-confidence of Ostrava and its people. The light blue colour of the city’s name is based on the heraldic tradition, while the exclamation marks are a contrasting darker blue. The logo is intended to be striking, provocative and above all memorable. The first written mention of Silesian Ostrava (Slezská Ostrava) dates from 1229, when it was described as a settlement. The first mention of Moravian Ostrava (Moravská Ostrava) describes it as a township (1267). Ostrava grew up on the banks of the Ostrá River (now the Ostravice), from which it took its name. This river still divides the city into two main parts: Moravian Ostrava (Moravská Ostrava) and Silesian Ostrava (Slezská Ostrava). The settlement occupied a strategic position on the border between two historical provinces (Moravia and Silesia) and on the ancient trade route from the Baltic to the Adriatic known as the Amber Road. This location helped the town to grow and flourish. However, Ostrava began to decline in importance after the Thirty Years’ War, when it was occupied by Swedish forces in 1621-1645. A turning point in Ostrava’s history came in 1763 with the discovery of extensive deposits of high-quality bituminous coal on the Silesian bank of the Ostravice River. In 1828 the owner of the local estates, Archbishop Rudolf Jan of Olomouc, established an ironworks, known after him as the Rudolfshütte. Later the ironworks passed into the ownership of the Rothschild family, and became known as the Vítkovice Ironworks. This company became the driving force behind Ostrava’s industrial boom; by the second half of the 20th century the city was nicknamed the country’s “steel heart”. After the Second World War and Ostrava’s liberation by the Red Army, the city entered its greatest period of expansion. Initially the new housing projects were on a relatively small scale, focused on the Poruba district (featuring distinctive architecture in the style of Socialist Realism). Later the authorities built larger-scale developments of prefabricated apartment blocks in Poruba and created a series of satellite estates to the south of the city (Ostrava-Jih). The city centre was gradually depopulated and people were moved out to the suburbs; this was part of a grand plan to destroy the city centre entirely and turn the land over to coal mining. The 1990s brought a rapid decline in the city’s traditional industrial sectors: iron, steel, chemicals and coal-mining (the last coal was mined on 30 June 1994). This was accompanied by major investments in rectifying ecological damage done by decades of heavy industry; these projects ultimately brought major improvements in the city’s environment and quality of life. Ostrava became an important tourist centre, offering easy access to the nearby Jeseníky and Beskydy Mountains. In addition to hundreds of hectares of recultivated former mining land, the city also boasts numerous natural landscape features of interest, many of which are protected nature reserves. These include the Polanka Forest (Polanský les) and the Polanka Meadows (Polanská niva), both of which form part of the Poodří (Odra Basin) protected nature reserve. A rare geological feature found within the city are the granite erratic boulders – originally from Scandinavia, they were left behind after the last Ice Age when the ice sheets retreated. Another unique feature is the Ema slag-heap, an artificial hill made of mining waste (slag) which offers panoramic views; the waste is still burning deep beneath the surface, giving the slag-heap its own microclimate. 1229: the settlement of Silesian Ostrava is mentioned in a document of Pope Gregory IX. 2015: established international partnership with Shreveport, Louisiana as a sister city. Ostrava is situated at the meeting point of four rivers: the Odra, Opava, Ostravice and Lučina. Thanks to its location in a broad river basin known as the Moravian Gate, Ostrava is mostly low-lying (highest point 210 m above sea level), and has a Central European climate with typical flora and fauna. It differs from most neighbouring regions by the high concentration of industry, dense population and the geographical conditions of the Ostrava basin. The climate features hot, humid summers and relatively mild winters, with an average annual temperature of 10.2 °C (January: -1.2 °C, July: 23.5 °C) and average annual precipitation of 580 mm. Ostrava is 20.5 km across (as the crow flies) from north to south (Antošovice–Nová Bělá), and 20.1 km across from east to west (Bartovice–Krásné Pole). The total length of the city’s road network is 828 km. The city, with a total area of 214 km2, is divided into 23 Municipal Districts. 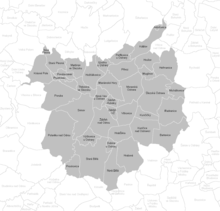 On 14 September 1990 Ostrava’s City Authority decided to divide the city into 22 districts, effective from 24 November that year. On 1 January 1994 the district of Plesná broke away from the Poruba district to become the youngest Municipal District. Some of the Municipal Districts are further subdivided into smaller units. The first mayor of Moravian Ostrava – and the last person to hold the office during the pre-1918 era, when the Czech Lands were part of the Austro-Hungarian Monarchy – was Hermann Zwierzina. One of the most influential mayors in the city’s history was Jan Prokeš; he was one of the main driving forces behind Ostrava’s rapid expansion and helped to modernize its infrastructure. His achievements are commemorated in the name of the square outside the New City Hall – Prokeš Square (Prokešovo náměstí). The city’s mayor during the Nazi occupation – Emil Beier – amalgamated Moravian Ostrava and Silesian Ostrava to form a single administrative unit. Post-war mayors of note include Zdeněk Kupka, Evžen Tošenovský (who was elected mayor for three successive terms from 1993 to 2001, and later went on to become the President of the Moravian-Silesian Region), and Petr Kajnar (who helped to develop the industrial zones in Hrabová and Mošnov which created over 9,000 new jobs by 2014). The current mayor, elected to the office in 2014 6. November, is Tomáš Macura. Ostrava’s Regional Court is based in a historic building on the Ostravice embankment (Havlíčkovo nábřeží) in the city centre. Its jurisdiction extends to the whole of the Moravian-Silesian Region. The District Court is based in a new building on U Soudu St. in the Municipal District of Poruba. 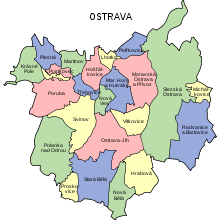 Its jurisdiction covers the territory of the City of Ostrava. The district courts of Ostrava and Brno are the largest in the country in terms of the number of judges. In addition to these courts Ostrava is also home to regional and district Public Prosecutor’s Offices, as well as a branch of the Olomouc-based Supreme Public Prosecutor’s Office. Ostrava is the natural transport and logistics hub of the north-eastern part of the Czech Republic. 25 km south of the city centre is an international airport – Leoš Janáček Airport Ostrava – which links the city with several European destinations (IATA code: OSR; ICAO code: LKMT). It is the first airport in the Czech Republic to have its own rail link. It handles scheduled flights several times a week to Prague, Paris, London and Düsseldorf. In the summer season there are also numerous charter flights, mainly to destinations in the Mediterranean region. The road infrastructure of the region is centred on the D1 motorway, which runs from Prague via Brno and Ostrava into Poland. Ostrava is 360 km from Prague by motorway, 170 km from Brno, 90 km from the Polish city of Katowice, and 310 km from Vienna. Other major roads are Class I roads 11, 56, 58, and 59, as well as the E75 and E462 trans-European routes. Ostrava is also a major railway hub, situated on Railway Corridors II and III and functioning as an important centre for cargo and passenger transport between the Czech Republic and Poland/Slovakia. The city’s largest railway stations are the main station (Ostrava-hlavní nádraží) and Ostrava-Svinov. These stations are important railway junctions. All trains of the company Czech railways, RegioJet and LEO Express are standing there and connecting Ostrava with Olomouc, Pardubice and Prague. The city also has a dense public transport network consisting of trams, buses and trolleybuses. Trams were first introduced in 1894; initially they were powered by steam engines. The network was rapidly expanded, and in 1901 it was electrified. New tram lines were built mainly to the south and east of the city centre, where they would not have to cross the narrow-gauge rail lines connecting Ostrava with Karviná and Bohumín. In 1934 the railway line in Vítkovice (operated by the Vítkovice Ironworks company) was also electrified. In the late 1940s and early 1950s the various companies providing tram services in Ostrava were merged to create the Ostrava City Public Transport Corporation (Dopravní podnik města Ostravy). During the communist era new tram lines were built to link the central parts of the city with the new satellite estates (Poruba) and factories (Nová Huť). After the Velvet Revolution in 1989 most tram-building projects were stopped, though a new section running along Místecká Road was opened in the late 1990s. Currently Ostrava’s trams rank among the best-equipped and most modern in the Czech Republic. Trolleybuses were first introduced in 1952 (as in other Czech towns and cities after the Second World War). Initially there was one trolleybus route which encircled the city centre, but the network was gradually expanded in the 1950s and 60s, replacing the narrow-gauge railways. A route to the Fifejdy housing estate was built in the late 1970s. The last expansion of the trolleybus network came in the mid-1990s, when a route was built out to the suburb of Koblov. There are 17 tram lines currently operating in Ostrava. There are 52 bus lines and 14 trolleybus lines. There are plans to link the Odra River in Ostrava up to the proposed canal connecting the Danube with the Odra (Oder) and Labe (Elbe). Ostrava’s high concentration of heavy industry means that the city faces certain environmental problems, particularly in relation to air quality. Measurements performed by the Czech Hydrometeorological Institute show that levels of atmospheric benzopyrene and dust particles rank among the highest in the country. Although Ostrava still has to contend with environmental issues, much progress has been made and continues to be made – not least thanks to the implementation of strict environmental requirements by ArcelorMittal, one of the biggest polluters in the region. In 2015 ArcelorMittal implemented 13 major ecological investment projects worth CZK 3 billion; one new installation filters out 61 tonnes of dust per year. The City of Ostrava is also involved in a range of projects focusing on environmental improvements. These include the special web portal www.dycham.ostrava.cz, which enables citizens to monitor current air quality indicators, and a project funding short “health breaks” for children from high-risk areas. One of the most pressing environmental problems currently facing the city concerns the oil lagoons at the site of the former Ostramo chemical plant. In 1996 the Czech government took control of the site and drew up plans for a cleanup; the state-owned company Diamo was created to implement these plans. The situation has recently been the subject of government-level discussions, and the Finance Minister Andrej Babiš visited Ostrava in March 2015; the situation is currently under review by the Ministry of Finance, which is drawing up conceptual documentation and will then announce a public tender for the cleanup work. Ostrava has four permanent theatres. The National Moravian-Silesian Theatre has two venues (the Antonín Dvořák Theatre and the Jiří Myron Theatre). There is also the Petr Bezruč Theatre, the Aréna Chamber Theatre and the Ostrava Puppet Theatre – which hosts the international Spectaculo Interesse festival every odd-numbered year and the Theatre Without Barriers festival every even-numbered year. Ostrava has a rich musical life, featuring the internationally renowned Janáček Philharmonic Orchestra. The city hosts a number of international annual or biennial classical music festivals, including Janáček May, the St Wenceslas Music Festival and the Ostrava Days new music festival. Since 2002 Ostrava has been the venue for the annual multi-genre music festival Colours of Ostrava, which brings globally renowned performers to the city along with tens of thousands of visitors from all over the world. Other major international events in Ostrava’s cultural calendar include the film and theatre festivals One World, Ostrava Camera Eye (Ostrava Kamera Oko), the International Outdoor Films Festival, and the Summer Shakespeare Festival (held on an outdoor stage at the Silesian Ostrava Castle). Folklore festivals include the ‘Harmony’ (Souznění) international festival of Advent and Christmas traditions and crafts, Folklore Without Borders, and the Irish Cultural Festival. Ostrava also has a plethora of museums and galleries. The Ostrava City Museum, located in the beautiful 16th-century old city hall building on the main central square, offers permanent exhibitions on the city’s history, landscape and people. The Ostrava Science and Technology Centre is a fun and interactive attraction where visitors can lean all about the fascinating world of technology. Highlights include simulators where visitors can drive a train, fly a plane, or try their hand at being a steelworker, an astronaut, or even Captain Nemo – helping people of all ages understand the complex principles of science in an entertaining and accessible way. The Science and Technology Centre is divided into two parts: the Small World of Technology, and the Large World of Technology (14,000 m2), where visitors can explore four different “worlds” in one building. Ostrava’s Toy Museum offers rare exhibits from over 60 countries, including some toys dating back to the mid-19th century. At the Railway Museum, children will love the model trains, while history-lovers will appreciate the collection of original documents from the days of the Austro-Hungarian Empire. Visitors to the Brewery Museum will learn all about the history and technology of brewing – followed up by a tasting session after the tour. The Firefighting Museum is situated in a beautiful Art Nouveau (Secession) building in Ostrava’s Přívoz district that used to be a fire station. The exhibition includes a video showing firefighting techniques. The Keltička’s Forge Museum used to be the home of a blacksmith named Keltička (commemorated in a small memorial outside the building). According to the local legend it was he who first discovered Ostrava’s rich coal deposits. The museum maps the early beginnings of Ostrava’s coal mining industry, including a collection of miners’ helmets and lamps from the 17th century and a range of other fascinating exhibits. The Professor F. Pošepný Geology Pavilion includes over 15,000 exhibits of minerals, rocks and fossils. Ostrava’s proud tradition of mining makes it the ideal place for one of the country’s foremost geology collections. The House of Art (Dům umění) is one of Ostrava’s architectural gems from the early 20th century. Thanks to the high quality and variety of its collections, it ranks among one of the Czech Republic’s top five galleries. The PLATO (Ostrava City Gallery) does not have its own collections – instead it offers a space for exhibitions showcasing a wide variety of contemporary Czech and international art. Many of Ostrava’s architectural gems are concentrated in the city centre, which forms a protected heritage zone. The most impressive structures in this historic core are theatres, banks, department stores and other public buildings dating from the turn of the 20th century, at the time of Ostrava’s greatest boom. The central square – named Masaryk Square (Masarykovo náměstí) after the first President of the independent Czechoslovakia T.G. Masaryk – features the historic old city hall building and a Marian plague column from 1702. A few blocks away is Smetanovo náměstí (Smetana Square), with the Antonín Dvořák Theatre and the Functionalist “Knihcentrum” bookstore. To the west are a series of grand, imposing bank buildings and the Elektra Palace on Nádražní St., while to the north is the New City Hall with its landmark viewing tower, looking over the impressive wide open space of Prokešovo náměstí. The city centre also has two notable religious buildings – the 13th-century Church of St Wenceslas and the Cathedral of the Holy Saviour, the second largest church in Moravia and Czech Silesia. Many of the buildings in Ostrava’s central district were designed by famous architects such as Karel Kotas, Josef Gočár, Ernst Korner and Alexander Graf. Poruba is a large district of Ostrava in the western part of the conurbation, renowned for its distinctive 1950s architecture in a style which was known as Socialist Realism. Inspired by the grandiose buildings of Soviet cities, Poruba also incorporates historical pastiche features drawing on ancient, Renaissance and Classicist models. The main entrance to the part of Poruba built at this time is through a grand triumphal arch (in Czech “Oblouk”). Ostrava’s Vítkovice district was the centre of the local iron and steel industry for decades. The influx of workers led the company to build housing for its employees, plus civic amenities, a town hall and a church. The historic parts of the district are built in the company’s distinctive style featuring red-brick façades. Other districts of the city with a distinctive architectural heritage include Přívoz (with its grand Secession buildings) and the “Jubilee” housing development (Jubilejní kolonie) in Hrabůvka, built as a workers’ housing complex in the 1920s. Tourists come to Ostrava mainly to enjoy the city’s unique industrial atmosphere and heritage or to experience one of the many festivals held here; particularly popular attractions include the Lower Vítkovice area, the Michal Colliery (now a museum where visitors can experience the authentic environment of a beautifully preserved coal mine) and the Mining Museum at Landek Park (set in an area of outstanding natural interest). The city has also developed a new mobile app called The Salomon Code, an adventurous way to learn about Ostrava’s rich history based around the story of Baron Rothschild; visitors discover numerous fascinating and unique locations throughout the city in a quest to find a magic amulet. Ostrava has also become a popular destination for film-makers, attracted to the city by its striking industrial vistas and powerful genius loci. Ostrava’s New City Hall(Nová radnice) has the tallest tower of any city hall in the Czech Republic, giving visitors a panoramic bird’s eye view of the city from the viewing platform 73 metres above the ground. Guides point out local landmarks and tell visitors about the city’s past and present. Tours are every 30 minutes. Comenius Gardens (Komenského sady) is a park named after the great Renaissance-era Czech writer and educator Jan Amos Comenius, this is an oasis of calm in the heart of the city – with yoga sessions, joggers, picnickers, and a statue honouring the Soviet soldiers who liberated Ostrava in 1945. A perfect place to stroll along the riverbank and then pause to enjoy a coffee at the riverside café before seeing some more of Ostrava’s sights. The Miniuni World of Miniatures is a unique attraction at the Black Meadow (Černá Louka) exhibition grounds, including miniature versions of some of the world’s most famous buildings. Who could resist travelling around the whole world in just one afternoon? Pose for photos next to Ostrava’s very own Pyramids, Eiffel Tower, or Big Ben. The fairytale clock at Ostrava’s Puppet Theatre features figurines which put on a magical show at two-hour intervals from 8 a.m. to 8 p.m. The performance lasts two minutes. It depicts a battle between Kasper the clown and the Grim Reaper, and it also features four other characters – an angel, a king, a queen, and a devil. The best time to see this wonderful illuminated clock is in the evening. The Silesian Ostrava Castle once stood on higher ground, but during its long history it has sunk by 16 metres due to mine tunnels collapsing underneath it. It is situated not far from Ostrava’s central Masaryk Square, at the point where the Lučina and Ostravice rivers meet. The castle is a favourite venue for events throughout the year – including the summer Shakespeare festival and a range of fun events for children and families. Stodolní Street is Ostrava’s legendary entertainment district, boasting over 60 bars, clubs, restaurants and cafés offering a huge range of food and drink plus music of all genres. Like New York, Stodolní Street never sleeps! Masaryk Square (Masarykovo náměstí) is named after the first President of the independent Czechoslovakia T. G. Masaryk. 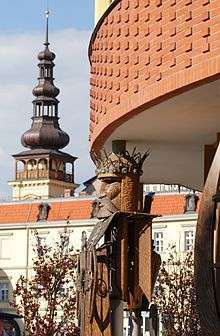 The square lies at the heart of Ostrava’s historical centre and boasts a plague column with a figure of the Virgin Mary (1702) and a Baroque statue of St Florian – the patron of firefighters. Take a stroll back through the centuries with a series of commemorative paving stones starting outside the Laso shopping mall. Admire the Schönhof building – nicknamed “the house with seven doors”, or the Reisz building designed by the famous Viennese architect Wunibald Deininger. The Karolina “Triple Hall” (Trojhalí) is a unique urban space located next to the Forum Nová Karolina shopping mall. These huge historical buildings – formerly part of the Karolina coking plant – have been transformed by the architect Josef Pleskot into an exciting new venue for sports, entertainment and culture. Take a stroll and feel the inspiration of Ostrava’s proud industrial past. Ostrava’s zoo is the second largest zoo in the Czech Republic and home to over 400 different species of animals. With modern exhibitions, new animal houses, evening tours, public feeding sessions, and cross-country skiing in winter, this is the perfect choice for a great family day out. In 2014 a new safari park was built, and in 2015 the zoo opened an exciting new pavilion illustrating the process of evolution. Lower Vítkovice is a unique industrial world in the very heart of the modern city. Visit the historic blast furnace and ride the glass elevator to the newly built viewing platform at the top to enjoy stunning panoramic views of Ostrava and the surrounding countryside – a perfect place to enjoy a coffee or a snack. Then you can take a guided tour – learn all about Vítkovice’s fascinating history from its early beginnings (when the ironworks were owned by the Rothschild family) until the present day, walk into the depths of the blast furnace, and visit the former power station, compressor hall and coal mine. Admire the former gas holder, which has been completely transformed into a cutting-edge multifunctional hall known as the Gong. Or visit Ostrava’s new Science and Technology Centre – a wonderful interactive attraction for all the family. The Ostrava Science and Technology Centre is a fun and interactive attraction where visitors can lean all about the fascinating world of technology. Highlights include simulators where visitors can drive a train, fly a plane, or try their hand at being a steelworker, an astronaut, or even Captain Nemo – helping people of all ages understand the complex principles of science in an entertaining and accessible way. The Science and Technology Centre is divided into two parts: the Small World of Technology, and the Large World of Technology (14,000 m2), where visitors can explore four different “worlds” in one building. The Michal Colliery showcases Ostrava’s fascinating history of mining at this exquisitely preserved former coal mine. The guided tour leads along the same route taken by the miners when they started their shift. Admire the unique chain-system changing room, the bathrooms, dispatch centre, and power station. The only thing you can’t do here is actually go underground – for that, you’ll need to visit Ostrava’s other mining museum at Landek Park. Landek Park – Mining Museum: at this fascinating museum you can take a tour of the former Anselm coal mine with a guide who used to be a miner there. The tour includes a descent into a simulated mine tunnel – giving a real sense of the noise and atmosphere of a working colliery. There is also a restaurant where you can sample authentic miners’ specialities. A perfect way to immerse yourself in the rich culture of this proud profession. Follow the green-marked hiking path to Ostrava’s Planetarium, where you can expand your knowledge of the universe or enjoy listening to relaxing music and admiring projections of the night sky – see the stars in all weathers! Ema slag-heap: on the right bank of the Ostravice River, this slag-heap (an artificial hill created by piling up slag, or waste material from coal mines) reaches a height of 315 metres above sea level. It enjoys its own unique subtropical climate because the waste material is still burning deep beneath the surface – you’ll see the white smoke coming out of the cracks in the ground. Snow never settles here, and flowers grow all year round. Take the yellow-marked hiking path to the top of Ostrava’s very own volcano, where you can enjoy some wonderful panoramic views of the city. Ostrava has hosted the prestigious Golden Spike international athletics meeting every year since 1961. Ostrava is home to a number of top-level sports clubs: FC Baník Ostrava (football), HC Vítkovice Steel (ice hockey), NH Ostrava (basketball), 1. SC WOOW Vítkovice and Remedicum Ostrava (floorball), Arrows Ostrava (baseball and softball), and VK Ostrava (volleyball). ↑ "Ostrava Public Transportation Website". 28 November 2016. Look up ostrava in Wiktionary, the free dictionary. Wikimedia Commons has media related to Ostrava. 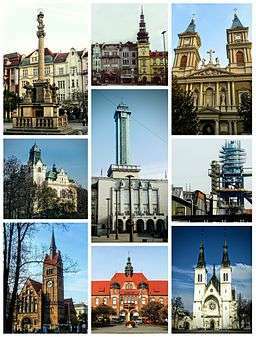 Wikivoyage has a travel guide for Ostrava.